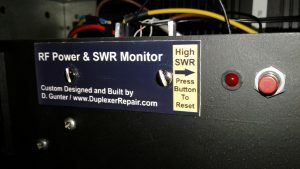 Monitor/Alarm system, which constantly measures the transmitter’s forward and reflected power in Watts, and uses an algorithm to precisely calculate the VSWR, all of which is in turn displayed on the front panel. In the event of a high SWR event, the LCD display shows the actual VSWR and an audible alarm is activated. In addition, an SWR alarm LED turns on, which remains lit until a momentary contact button is pressed, resetting the alarm condition. 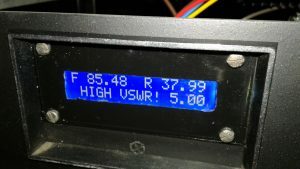 I wrote the Arduino IDE sketch code to “latch” the LED so that in the event of a temporary high SWR event (ice on the antenna, for example) the system can continue to update and display real-time power and SWR readings but there will be a visible indication on the front panel that a temporary high SWR issue occurred. The above video shows the system running my v2.4 Arduino sketch code. 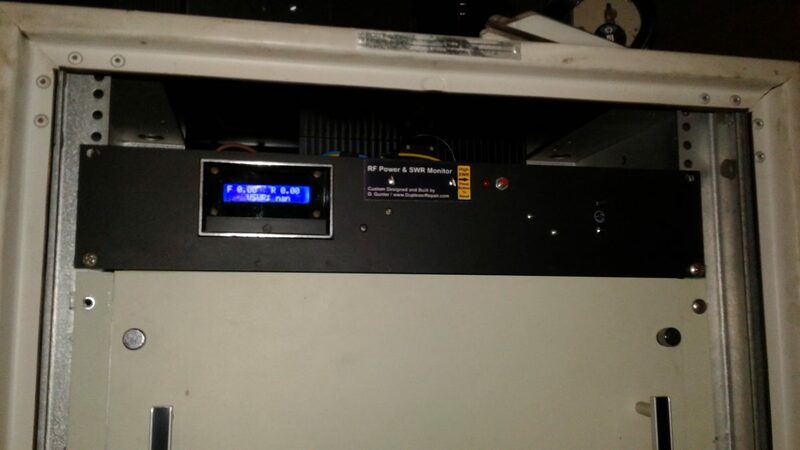 There will be future updates to the code and the hardware, as I intend to add features such as temperature monitoring, remote access/monitoring, automatic alerting of alarm conditions via RF signaling and/or internet linking, etc. I most likely will end up designing and building a custom Arduino “shield” for a much neater, quicker, easier installation and deployment. The main thing is that the first working version of this monitoring/alarm system is now built, installed, operational, and doing everything I originally intended to do. This initial build has a few cosmetic imperfections, but hey… in the future I’ll use a better grade of paint when “masking off” all but the desired portion of the original lens/bezel assembly to accommodate the actual LCD display size and repainting the front panel to do away with the original labeling, etc. Until then, it does the job, so who cares if it doesn’t look all spit-polished like it was made in a factory (with a price tag to prove it) ?!?!? !